I have read Circling the Sun and The Paris Wife, giving both four stars on goodreads. Paula McLain is a historical fiction novelist who fills her stories with facts! As luck would have it, I took the 3:40 train into the city, a local. This meant it would take 70 minutes vs. 50 on the express, gifting me time to make a call, relax and enjoy a leisurely trip. It was nice to sit after a busy weekend. The forecast called for a brief rain shower around 7 PM so I was surprised to see rain minutes before arriving at Penn Station. I bought an umbrella for $5 and walked up the stairs to the start my walk. Uber and taxies were in high demand, and I enjoy walking, but this ended up leaving me feeling like a wet noodle by the time I arrived at Random House. Oh, how the wind swirls up the avenue! These are my people... While I was a few minutes late to the happy hour, Nicole arrived in time to secure a table up front. Thank you, my friend! I settled in with a glass of wine and jumped into the conversation. The other women at our table were delightful - we all love books and travel. Paula is one of the most outgoing author's I have met, making for easy exchange with the moderator. Storytelling a clear gift. After spending just five minutes with her, it's clear she loves Hemingway. 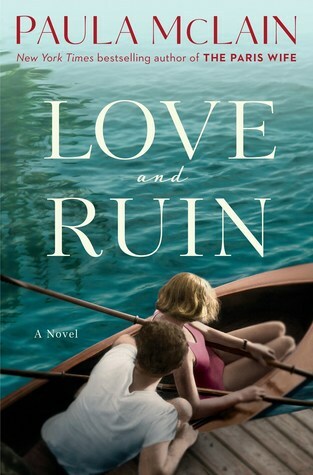 Love and Ruin is her second novel with the great author, both told from a woman's perspective. While I know he had several wives, I was not familiar with Martha Gellhorn. I'm curious and can't wait to learn more about this amazing woman. As a young woman, Martha Gellhorn moved to Paris with two suitcases, a typewriter, and $75, as her literary heroes Hemingway and Fitzgerald had done. Synopsis: In 1937, twenty-eight-year-old Martha travels alone to Madrid to report on the atrocities of the Spanish Civil War and becomes drawn to the stories of ordinary people caught in devastating conflict. She also finds herself unexpectedly—and uncontrollably—falling in love with Hemingway, a man already on his way to becoming a legend. NOTE: Take a few minutes to explore the author's website as a companion to the novel. I started reading Love and Ruin yesterday. Fully engrossed, I read fourteen chapters without looking up. Summer reading season has started. What's on your list to read this summer? I'm always looking for books to add to my list, and have a few trips planned over the summer.